That is all the importance which Swami (Bhagawan Sri Sathya Sai Baba) gave to miracles. But then, it has been miracles at many levels that have drawn people all around the world to Him. After His physical departure (Mahasamadhi) on the 24th of April 2011, when I returned home, I was witness to a miracle that made my jaw drop open in awe and wonder. And then started a series of manifestations and materializations from a couple of pictures at home. Many times, as I would be working in office, I would get a call from home. Today, I decided to write about some of these manifestations at home. I shall not go into each and every episode but a selected few which are really special and unique in terms of how they occurred. And I share this with my world-wide family knowing that it will bring the same joy, faith and love that it brought (and continues to bring) to my heart. Finally, this writing is also to serve as a documentation. My wife, Pooja, and I woke up in the morning and it was a bit gloomy. The previous night, we had discussed something that had been bothering her a lot. Obviously, the night’s sleep hadn’t erased those thoughts and feelings from either of us. The aftertaste had lingered and there was a low feeling in the morning. And then, I felt that enough was enough. I began to speak to her about Swami saying that whatever was happening was for the best. We just have to trust Him and let go. At the same time, I told her to go to the altar (which is part of our bedroom itself) and read the Prayer of Surrender (PoS). This prayer is a favorite of mine. It has been written as a ‘piece of advice’ from Swami and has amazing power to calm one down. I don’t know from which discourse it has been taken. I don’t know when or to whom Swami gave this prayer. I simply love it so much that I have laminated a copy of the same for the altar. Pooja told me to read it out for her. So, I got up from bed, went to the altar, pulled out the laminated text and began to read it out to her. There is a ‘Lakshmi Yantram’, a mystical drawing supposed to propitiate Lakshmi, the Indian Goddess of wealth, placed in front of this laminated PoS. When I took the PoS out, the Yantram began to lean on the wall. I thought I would place it back properly when I replace the PoS behind it. And so, with my back to the altar I started to read out the PoS to Pooja who was lying in bed still. I look back and what do I see?! A heap of ‘Sindhur’ had formed right in front of the ‘Lakshmi Yantram’!! 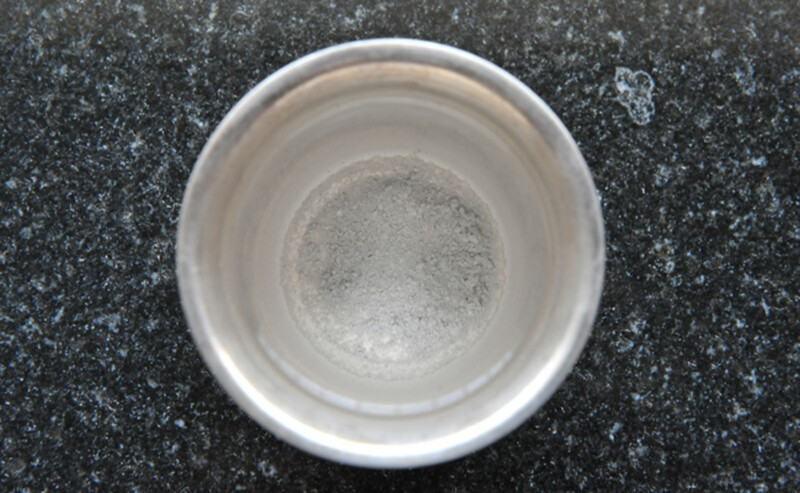 Sindhur is a special powder used by ladies as a mark of being married. 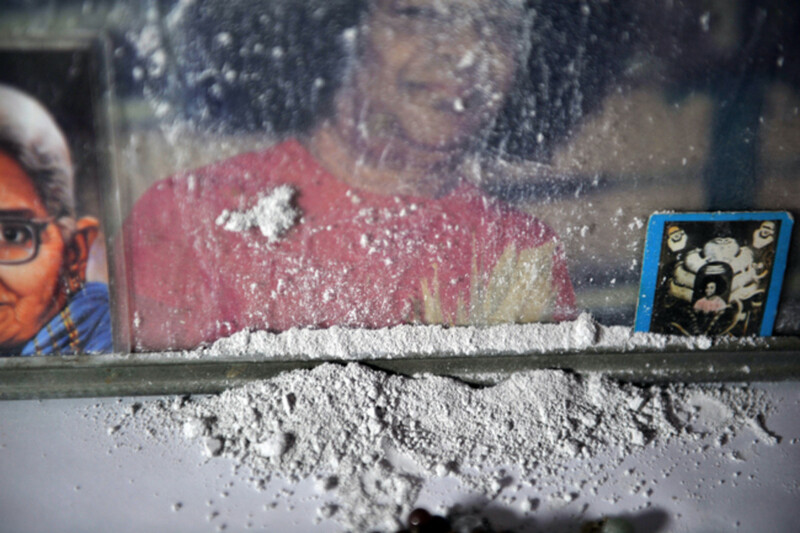 However, it is rarely used in South India where KumKum does the same job. I have never seen such Sindhur anywhere in Puttaparthi and I had not seen it just 25 seconds before when I took the laminated PoS from behind the Lakshmi Yantram!!! 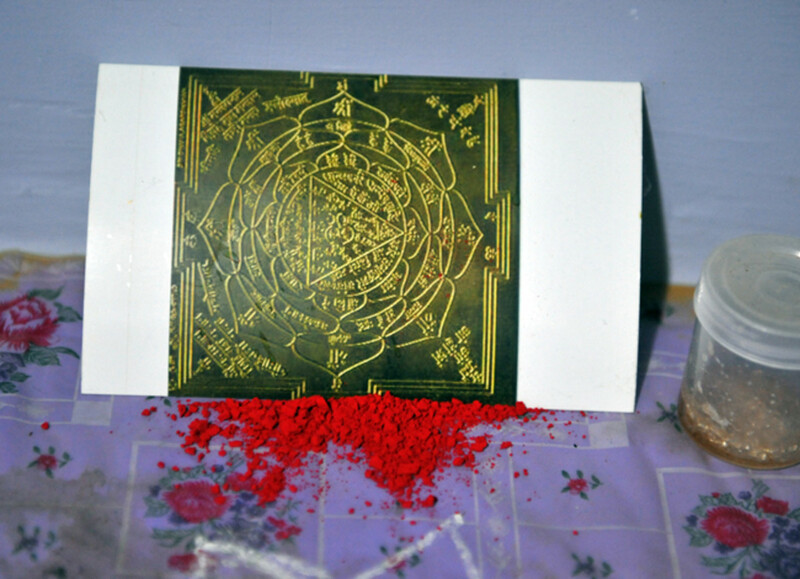 The sindhur that manifested in 25 seconds in front of the Lakshmi Yantram. I walked into the bedroom at 10pm, ready to go to bed when suddenly I ‘smelt’ Swami! 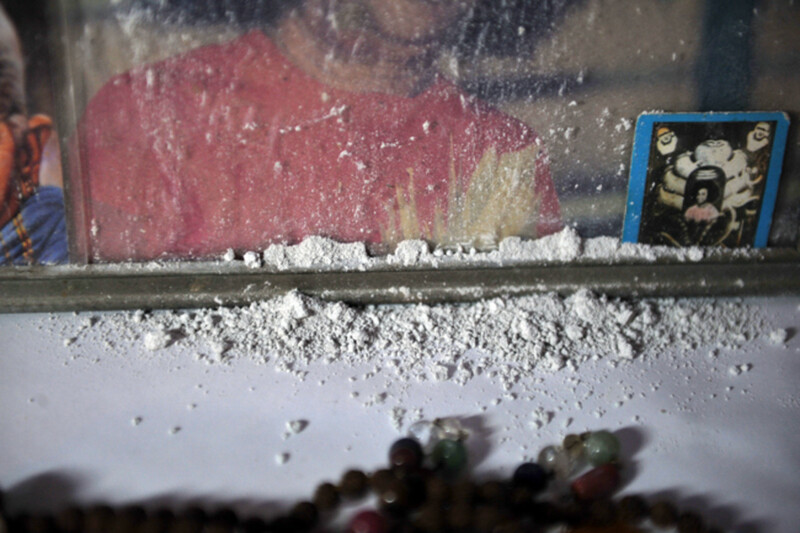 It was not a fragrance of vibhuti or incense. It was Swami’s fragrance and I quickly closed my eyes so the I do not lose that experience of Him by my side just because I was unable to see Him! I closed my eyes and the fragrance lingered and I was so thrilled. I asked Pooja whether she was smelling the same but the answer was a negative. Even when she came to where I was standing, she did not get the fragrance. We both agreed that Swami had indeed visited the room and was letting us know about it. 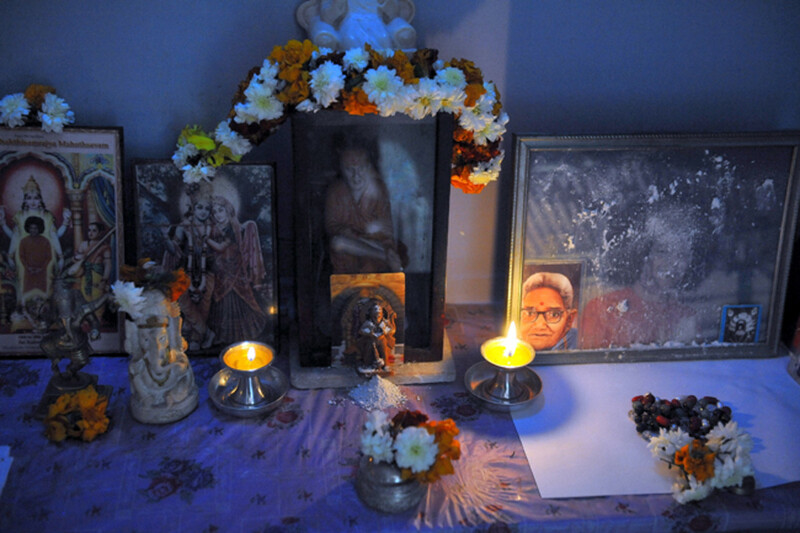 Since there had been Vibhuti coming from a couple of pictures, we thought we should check out whether any had manifested as proof of His presence. We went to the altar and scanned all the pictures. There was no vibhuti. 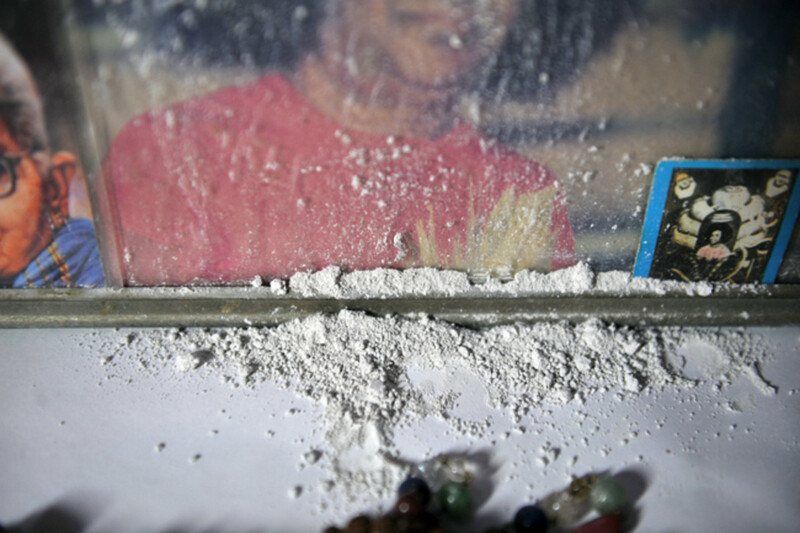 We also checked the ‘dinner plate’ which had been placed for Swami for sometimes it appears there. It was not there too. I was a bit puzzled because I could swear that I had ‘smelt’ Him! After about 10 minutes of searching in vain, we went to bed. And then, she showed me Swami’s silver tumbler of water. At the bottom, under the water, was a thick layer of vibhuti!!! The play of elements - 'Earth' under 'Water'! :) Vibhuti in the water tumbler! This has to be one of the most unforgettable episodes and I feel bad that I was not fast enough to shift my phone into ‘video’ camera mode. Maybe, He did not want it captured on video! It was my wife Pooja and I almost cut my chin! I quickly took a picture with my phone. I told her to inform my parents. She rushed out and even as I stood there, right in front of my eyes, another band of vibhuti formed on the picture and fell out in another heap! A big Vibhuti spot also formed on Swami’s shoulder in the photograph! And by the time my parents came to the altar, they could not see what Pooja was excited about because they were now seeing what I had become so excited about!! Of course, I showed them the picture I had taken so that they could also see the difference! This was how Pooja saw the picture after the first 'wave' of Live materialization. This is after the second wave of the Live formation. After the third wave! Notice the spot of vibhuti on Swami's right shoulder. The morning brought a pleasant surprise. 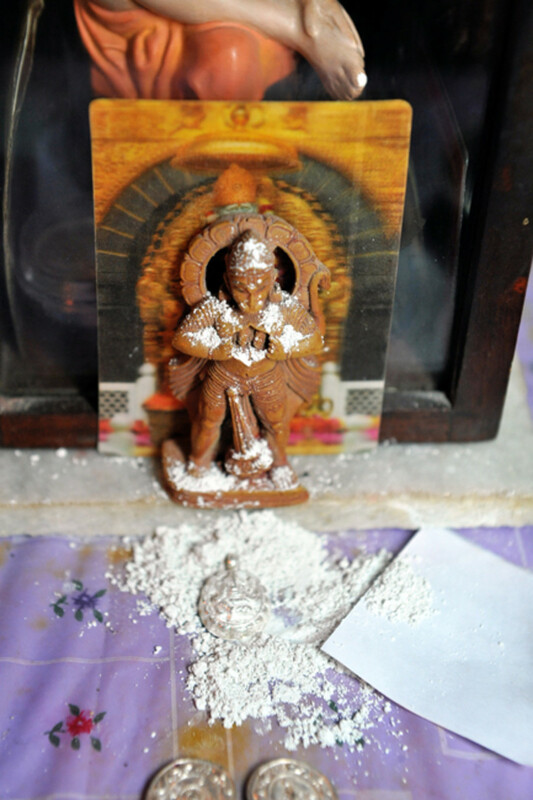 The small idol of Lord Hanuman in the altar had a big heap of Vibhuti right in front of it. This idol is of the ‘Monkey God’ in a standing pose tearing apart His chest to reveal Lord Rama and Mother Sita seated in the heart. No wonder that Swami has placed a 65-foot statue of Lord Hanuman on the Vidyagiri hill overlooking all His educational institutions at Puttaparthi. The vibhuti that had appeared seemed to have emanated from the ‘heart’ of Hanuman. It looked beautiful and we concluded that maybe it had appeared on New Year’s Day, January 1st, as a blessing for the year. The heap of vibhuti in front of Lord Hanuman in the altar as we saw it on the morning of the 2nd January. A close up of that 'joy-filling' heap! As is the practice, we do not collect the vibhuti that has manifested for at least a day. And so, we decided that we would collect the heap, the next day viz. 3rd January 2013. 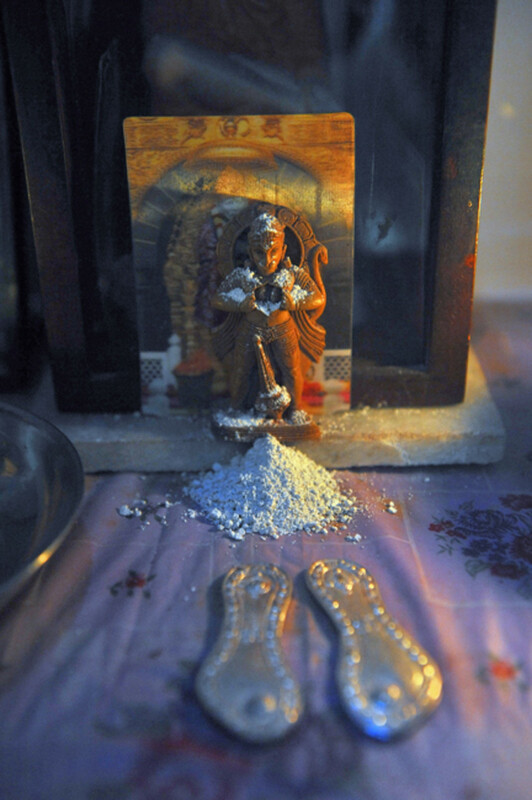 I finished my bath and went to the altar to clear the vibhuti heap. I made a ‘spoon’ from a piece of fresh paper and started to scoop off the heap. Even as I did so, the paper felt so heavy. The vibhuti I had gathered just fell down from the paper and along with it fell a small metallic object. I looked closely and saw that it was a silver medallion pendant of Lord Ganesha!!! I shouted out for my father. Pooja and mother had left for the mandir already. He came in and both of us drank in the darshan of this lovely Elephant God who is the remover of all obstacles. Two things struck us which made us so happy. 1. January 1st, the day when we believe the heap of vibhuti manifested, was also Sankashta Chaturthi, a day dedicated to the worship of Lord Ganesha. 2. This Ganesha was not in any traditional pose but in a meditative one! The trunk was not turned to the left as is the usual case but to the right. It is said that the Ganesha whose trunk is turned to the left grants worldly success, name and fame while the one whose trunk is turned to the right grants spiritual success and liberation. We felt happy that the Ganesha on the pendant was ‘Balmuri’ - right-curving and not ‘Edamuri’ - left-curving! The amazing discovery when the vibhuti heap was 'unearthed'! 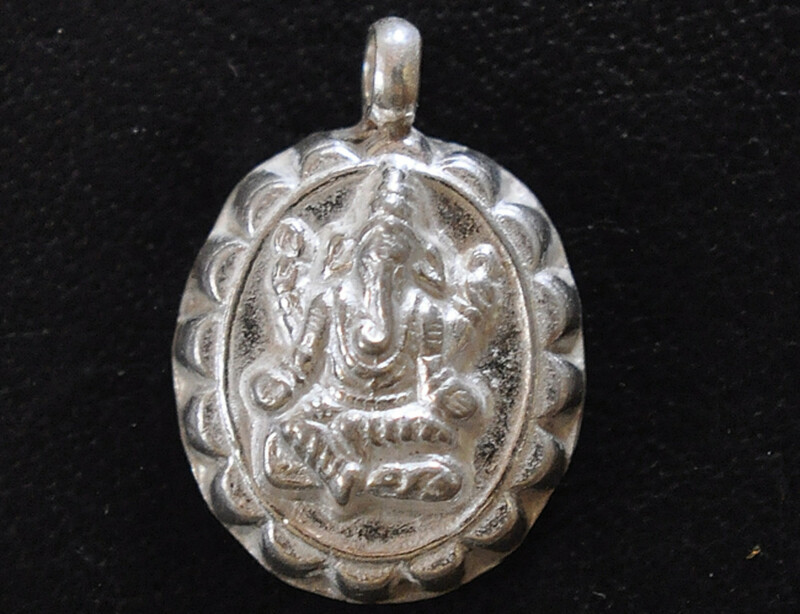 A close up of the Balmuri Ganesha on the silver medallion pendant. The phenomenon of Vibhuti in Chile,Sai Baba Center of Viña del Mar - Reñaca, Chile.